FREE UPS SHIPPING ON ALL ORDERS OVER $99! 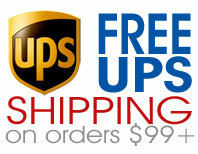 AEDs Today proudly provides free UPS shipping on all orders over $99. Depending upon the time in which your order is placed, most orders are shipped that day and arrive within 2 - 3 business days via UPS Ground. If you're in immediate need of an AED or accessory and would like to have your order expedited, please call us for rates and delivery options toll-free at (888) 225 - 7049.